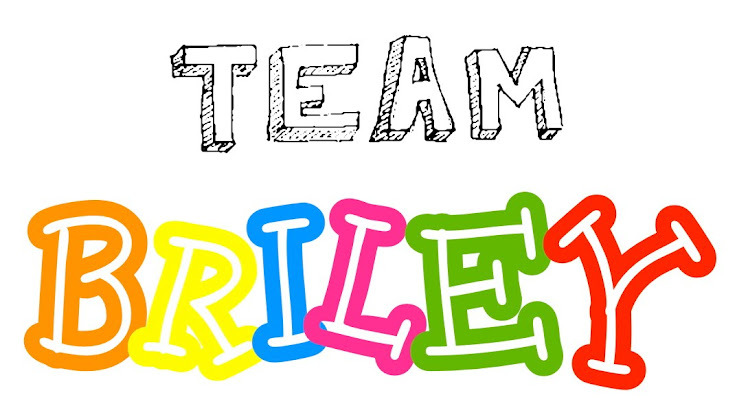 We are proud to announce that Team Briley will participate in the 2014 CureSearch walk at the Texas Motor Speedway in Fort Worth on April 26, 2014. This is the same walk that we attended a couple of years ago in Wichita, but we are going to Fort Worth this year. CureSearch is very important to us. 94% of the money raised will go towards pediatric cancer research. There is a desperate financial need for pedi cancer research since the government has cut some funding for it. Also, very little money is directed to the kids by the bigger name fundraising societies. CureSearch helps fund the Children's Oncology Group research trials. Briley has been and still is under these trials. Thanks to the trial that she was under during the maintenance phase, she received a 1/3 less chemo! That's huge! Update on Briley. She's doing very well! She is still going to Cooks once/month. Her next appointment on April 1st will mark one year off treatment. She will have numerous blood work done to make sure everything is working the way is should. After that, her appointments will be once every 2 months! That will be nice. We appreciate you! It was 3 years ago today that we were told that Briley has leukemia. I'll be perfectly honest with you, it seems much longer than that. So much has taken place over those three years. Both good & bad. We will always be reminded by the scars on her body and by the lasting effects of the chemo itself. However, we will continue to rejoice that she is here with us! She is back to being a kid! She has not been sick this year! Appointment days have been the only school days that she has missed this year and we are extremely grateful for that. So many other great things happened in 2013. Foremost, she took her last dose of chemo on March 30th. Then, we were blessed by Make-A-Wish and spent a week in Orlando, Fl at Give Kids the World, Disney World, and Universal Studios. 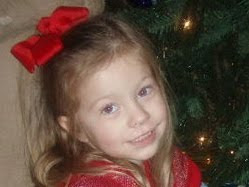 And in August, Briley had her port removed! These past 3 years have been a testimony to God's healing. There's no doubt in my mind that He helped her get through the fight for her life. In the same breath, we have known and seen so many other kids that have fought the battle until the very end and earn their angel wings. So many other kids have serious side-effects from chemo and radiation that they are left with severe disabilities. We will never understand the reasoning for all of this but we will continue to spread awareness and give the kids a voice. We have also been blessed by a community and many others that came together for her. There's no way we could have done it without the support. To date, this blog has been viewed over 109,000 times! We appreciate everyone that takes the time to get on here and read my terrible writing! Currently, Briley is doing very well. She started physical therapy this month to strengthen her legs and has been doing well with it. She still has monthly Cook appointments and will eventually have appointments every other month after March. There is not much to else to report and that it a good thing! There is a CureSearch walk in Fort Worth in April. We plan to have Team Briley there this year and I will post more details as they become available. Once again, thank you for everything you have done for us these past 3 years! Hi everyone! It's been over two months since my last post. Sorry about that, but there's not a whole lot to report (which is good)! Briley still has monthly appointments at Cooks. We've actually been going to the Cooks clinic in Grapevine the past 2 or 3 months. It's not busy there and we are usually out of there in 30 minutes or so. Briley has blood draws each time and count checks. She's a big girl now so she thinks that she doesn't need numbing cream to help with the needle sticks! She just lays her arm out there and let's the nurse take blood like it's no big deal! We are very proud of her! All of her counts have been coming back great. I must admit, I'm always a little apprehensive before getting the results. To many things run through my head. So far, so good. We pray and have faith that everything will continue to go as plan. Briley has stopped all of her meds. It's been nice not to give her meds other than an occasional allergy pill. The doctor has been a little concern with her weight gain. It's nothing major now, but it's trending up and something we'll have to keep an eye on. She explained to me that this is normal for kids coming off chemo. I've seen this with other kids myself that are just off treatment. I think it's simply a sign that she's finally healthy for the first time in 2.5 years! If that's all we have to worry about, then she is doing good! Life is busy around the Hostas household. It seems like we are going nonstop. Briley has Monday night dance class, Tuesday afternoon twirling, Alicia and the kids have "church school" on Wednesday nights. Bryson has soccer practice on Tuesday afternoon's and games on Saturday morning. Is all of this normal? We'll take it! There will be a CureSearch walk in Fort Worth at the Texas Motor Speedway this coming April and Team Briley will be there to help raise money for pediatric cancer research. I will post more information as soon as I get the team signed up and ready to go. We appreciate everyone that takes the time to read the blog and may God bless you. First off, let me apologize for not updating in quite a while. I did get in trouble with one person in particular for not updating. Won't mention names here, Alice! Briley's port removal was scheduled for this past Tuesday, 7/31. 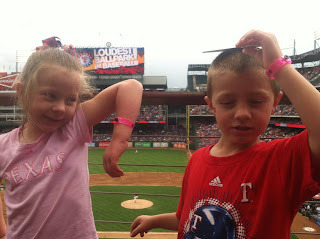 We traveled up the night before and met friends for a Rangers game. 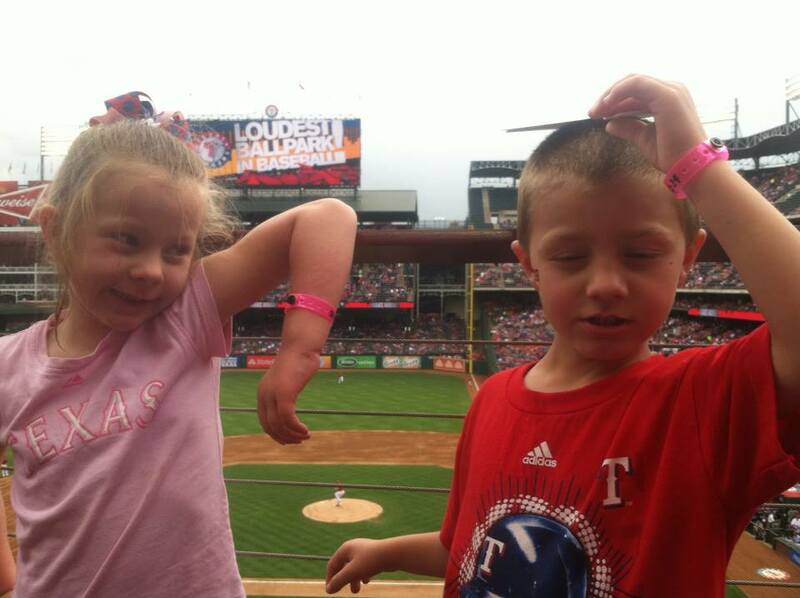 Briley and Alicia made a sign to hold up at the game that read, "This cancer survivor loves the Rangers"! She even had someone that saw the sign and wanted a picture with her! The game ended up being one of the best this year and the Rangers won! The game was lonnnnnggggggg. It lasted until midnight and we didn't get back to the hotel until 1:00 that morning. Of course, we had to be at Cooks first thing the next morning. The alarm started going off at 5:15am. To say the least, we were 30 minutes late getting to Cooks. Oh-well. We went through the motions, got her checked in, and it was time for the day we've waited on for a long time! She got her silly juice, poked herself in the eye, and off to the back she went. The doc that put her port in, took her port out. The surgery went great and we were done at 10:30. Of course Briley wanted to eat at CiCi's pizza on the way home. We got home, tired, but very happy that she can "officially" declare that she is now a cancer survivor!! We had a little scare with Bryson over the past couple of days. He had two big "bumps" show up on his arm. Of course, this had us a worried of what it could be, especially the "C" word. He had a sonogram done this morning and it showed two masses just under the skin. This afternoon, he was taken back to surgery to remove the masses. Turns out, it was two abscesses. They drained them and put drain tubes in. We are thankful that's all it was. So both of our kids had surgery within two days of each other. Maybe we can avoid hospitals for a while now! I will start work on an article to put in the paper about Briley's journey. I will publish it onto the blog once done so our out-of-town friends have a chance to read it. 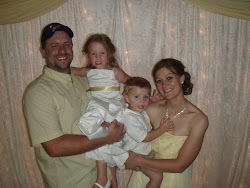 We appreciate everyones thoughts and prayers over the past 2 1/2 years. Briley will still have regular clinic visits at Cooks for the next 10 years, but they will just be check-ups. At some point, there will be a life after cancer study or two thrown in there. I will continue to update the blog on her progress. 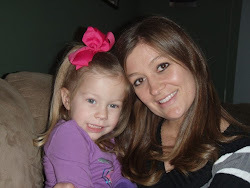 We appreciate everyone that has taken the time to get onto the blog and read about Briley's progress! Back from Briley's Wish Trip! 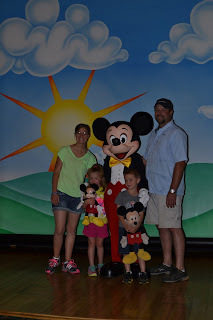 We got back from a fun filled week in Florida this past Saturday! It was an awesome trip and we all had a blast. I can't say enough good things about Give Kids the World and Make A Wish. On our way to DFW. We are excited! We caught a Rangers game before heading to the motel. Our hotel at the airport. 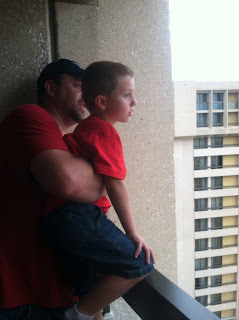 The kids loved standing on the balcony watching the planes takeoff. We would soon be on one to Florida early the next morning! This was our villa at GKTW for the week! 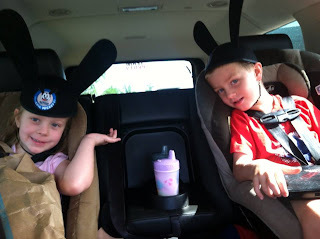 We stayed here and traveled to the theme parks during the day! Donald Duck showed up at GKTW the first morning! After meeting Donald and Mickey at GKTW, it was off to Disney World's Magic Kingdom! We walked up to a show at the Castle! First ride of the week, a spin in the tea cups! We ran into Andy and Jesse! Bryson loved it! Back to the village after a long day at Disney World. We found the village Mayor and his wife! The next day, we went to Universal Studios! 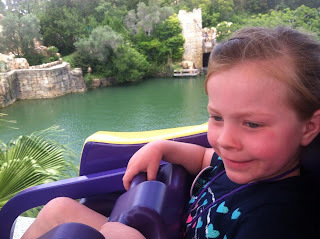 Briley's favorite ride! It was an elevated train with no ups or downs. She was terrified of roller coasters, so we didn't do many rides. Briley and Bryson even got to feed the dolphins! Yes folks, Bryson is sitting on a real gator! Briley wouldn't sit on it, but got close enough for a picture! A family pic with a gator and yes, that is a real snake around Bryson's neck! Once a week, it Christmas at GKTW! The pool at the village. Since Friday was Briley's birthday, she got to choose what to do during the day. So we swam all day! Briley having Birthday supper with the princesses at the village! Ms. Mary stopped by to tuck us in during our last night before departing the next morning. Give Kids the World is wonderful! Only wish kids and their immediate families are allowed to stay there. The village is a resort on it own with a ton of stuff to do! They provided the housing, meals, park passes, and plenty of activities! Most of the staff is consisted of volunteers. We would love to go back one day and volunteer! Everyone is very nice and will go out of their way to entertain the kids! We appreciate Make-A-Wish for giving us the opportunity to make Briley's wish come true! Briley's last day of kindergarten! Today will be Briley's last day of kindergarten! It's hard to believe that the year is over with already and she will be a 1st grader next year! She done great in school! It was a struggle at times with sickness and missing a lot of school, but we managed through it. Alicia has done a great job teaching her. Briley is reading great and loves reading books! I'm proud of her! Briley's Make-A-Wish trip is coming up fast. We'll leave early Saturday and catch a Rangers game. Spend the night and fly out to Orlando on Sunday. We will be staying at Give Kids the World. It's a resort on it's own and it's where most of the wish families stay. I think the hard part will be deciding where to go! There is so much down there the that it will be hard to decide what to do! I imagine on Monday, we'll start at Disney World! I can't tell you how excited we are! Briley's flu only lasted for a few hours. Well, at least the fever. The next day, she was back to herself and has stayed that way since. Now that's the way to have the flu! We are very thankful she did not get really sick from it. Everything else is going really well. 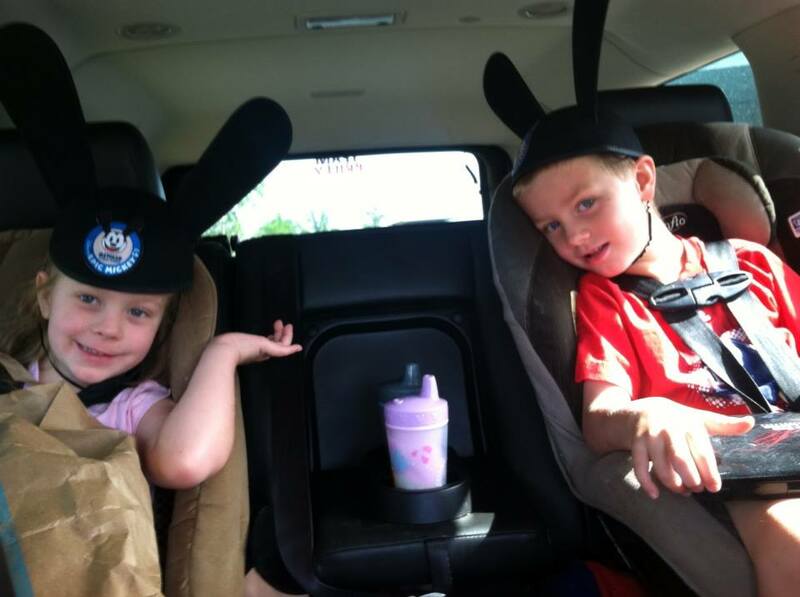 Bryson is doing great and having fun being a boy and picking on big sister. We are 10 days away from going on Briley's wish trip to Disney World. We are overly excited about it! We will be staying the night at the DFW airport for our flight departure at 10:30 the next morning. We've decided to head down to DFW earlier in the day and catch a Ranger's game before going to the hotel. I can't wait to see the kids reaction when we get on the plane and take off. I've got to admit, Alicia and I are nervous. I've flown a few times before, but it's been a long time (before 9-11). Alicia has flown once. I almost would like to drive and see a few sights between here and there, but the kids are so excited to get to fly and it will be part of the excitement. Briley Hostas is Cancer Free!